Are you having difficulties with your "black-box" feeder controllers? Melfi Feed© is the next generation of PLC-based Weigh belt, Loss-in-Weight and Flowmeter automated feeder controllers. The system is designed to directly replace the proprietary microprocessor equipment supplied by any of the popular LIW feeder manufacturers. The Melfi Feed© PLC controller has been developed around the Allen-Bradley ControlLogix and CompactLogix hardware platforms, using standard RSLogix5000 programming software with Rockwell Automation FTview HMI. The field communications to the Hardy Instruments load cell amplifiers are open standard Ethernet/IP components. We have created a cost effective solution using non-proprietary hardware to simplify the gravimetric feed control process. Melfi Technologies has completed a gravimetric feeder control retrofit at a major polyethylene resins producer. Each of the two compounding lines consists of a single main powder resin LIW screw feeder running at 30,000 pounds/hour, with four powder additive LIW feeders running at 10-150 pounds/hour. The existing feeders were the conventional LIW-screw and weigh belt using vibrating wire load cells. Maintenance for the proprietary electronics was becoming increasingly difficult, as parts and service were only available from the feeder manufacturer. The feeder manufacturer was pushing the customer to retrofit to their newest proprietary controller. The maintenance manager began searching for a replacement control system that specified components available from local distributors. Melfi Technologies was contacted and their applications personnel visited with a PLC demonstration control system. The gravimetric controller has been developed around the Rockwell Automation ControlLogix and CompactLogix hardware platforms, using standard RSLogix5000 programming software with RSView32 HMI. The field communications to the motor drives and load cell amplifiers can be open standard Ethernet/IP or DeviceNet components. After reviewing both their capabilities and previous installations, Melfi Technologies was awarded the project to convert two compounding lines. 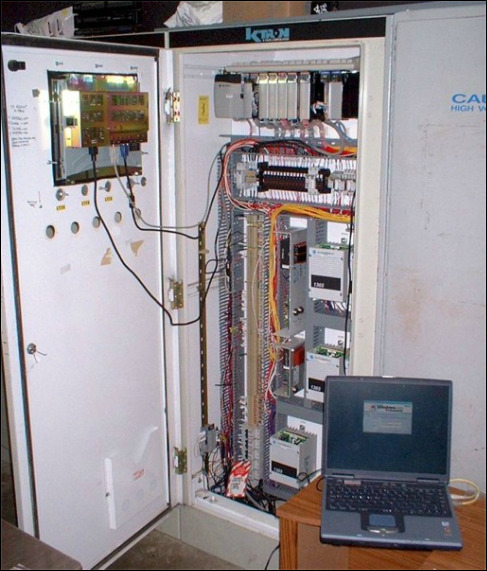 The entire proprietary microprocessor-based control system was removed and replaced with an Allen-Bradley ControlLogix PLC performing the LIW algorithms, using new Bulletin 1365 DC drives for motor control. Downstream of the pelletizer there is weigh belt feeder to totalize the finished pellet stream. The belt feed rate is controlled by an analog level indicator in the pre-feed hopper. The operator enters a level setpoint, and the PLC will control the belt speed to maintain the hopper volume. Hardy Instruments C2® DeviceNet weighing modules were mounted onto the individual feeders to directly read the load cell weight. The WAVERSAVER® signal filtering technology effectively eliminated any external influence from plant vibration. Hardy Instruments C2® certified load cells communicated the calibration parameters to the DeviceNet weighing modules, so the feeders could be calibrated without the need for calibration weights. Keeping all the field equipment on a DeviceNet network ensured only a single new field cable needed to be pulled for the entire load cell retrofit. The operator interface consists of a Rockwell Automation RSView32 local touchscreen monitor located in the control room, with a remote redundant touchscreen monitor located in the extruder panel for easy field access. All external selector switches and indicator lights previously mounted on the panel door were relocated to the touchscreen to allow operation from either monitor. Both lines were retrofitted, commissioned and operational within a two-week time span. The feeders continue to perform well, with greatly reduced downtime due to electronics failures. Since the initial commissioning there have been no additional service or repair return visits by a Melfi Technologies field programmer.